Children..Our Treasure features a parrot sporting a pirate hat and eye patch perched high above a floral island overseeing the “bounty”….The tropical floral treasure chest features strands of pearls, a pirate sword, gold coins, priceless vases, a washed up bottle with a special message inside, pitchers, shovels, starfish, coral, shells and a palm tree with a bounty of coconuts as it proceeds down Colorado Blvd. Materials used: Treasure Chest features gold clover seed, yellow fine cut strawflower, lock & latch, gold clover seed, white fine cut strawflower, dark brown coffee, yellow fine cut strawflower, black onion seed, light lavender walls-light lavender mums, 1/2 balls of shiny grey silverleaf, insets of gold clover seed, yellow fine cut strawflower, xmas, red mums, 1/2 balls of shiny grey silverleaf…rope features gold clover leaf, fine cut white strawflower, brown coffee, black onion powder, top lid outside is covered with gold clover seed, light lavender mums, xmas red mums, dark red cranberries, white button mums, blue berries, green limes, raised flex trim around insets has gold clover seed and shiny grey silverleaf..inside walls of gold, bronze fine cut strawflower, interior coloring hot pink carnations, top edge yellow fine cut strawflower, inside lid has tan fine walnut shells and brown coffee with lines of black onion, pearls are of white fine cut everlasting, sculpted vase inside chest is of yellow fine cut strawflower and gold clover seed-the sword handle is covered with yellow fine cut strawflower and gold clover seed with tan fine walnut shells, the blade is covered in shiny grey silverleaf, white fine ground rice, and dark grey poppy seed, gold coins feature yellow fine cut strawflower, white fine cut strawflower, gold clover seed and brown coffee with the “K”‘s covered in brown coffee and white fine cut strawflower and accents of gold clover seed…two sculpted pitchers on deck are covered with yellow fine cut strawflower, gold clover seed and brown coffee, the shovel handle is of bronze fine cut strawflower with the core shovel covered in dark grey poppy seed, shiny grey silverleaf-the garland on the nhandle features green english needlepoint ivy-Sculpted flowers are covered with white carnation petals, hot pink carnation petals, white ground rice, pink fine cut strawflower, green ground parsley flakes, white navy beans. Parrot features a hat covered with black seaweed, with yellow trim of yellow whole splits peas, yellow fine cut strawflower and plums of creme pampas grass his head & eye has creme farina, eye dot of black seaweed and eyeline of black onion powder, eyepatch and strap has black seaweed-face covered with white fine ground rice and black lines of black onion powder, beak of dark grey poppy seed with shiny grey silverleaf, nostrils of black onion powder, internal beak of black onion seed, chest of black hyacinth root, yellow carnation petals, gold carnation petals, back of parrot, yellow fine cut strawflower, light green fine ground split pea, light blue and dark blue iris petals, tail of dark blue iris petals and black ground onion seed, highlights of white powdered rice and under area of blue fine cut statice-wings of black ground onion seed, dark blue iris petals, light green fine ground split peas, bronze fine cut strawflower, yellow carnation petals, Claws dark grey poppy seed, black ground onion seed and white fine ground rice-washed up bottle covered with white powdered rice with hot pink fine cut statice, light pink fine cut strawflower with light and dark blue fine cut statice, blue cornmeal, light grey ground white pepper-note inside the bottle-dark brown coffee and light brown spices with tan fine walnut shell and creme farina, lettering of black onion powder, cork of tan paper bark, starfish covered with white fine ground rice, yellow, bronze, dark pink fine cut strawflower, hot pink statice, white button mums and red cranberries. Fan-like shells-white fine ground rice, dark grey poppy seed, purple fine cut statice. Palm Tree-fronds, tops are covered in green ti leaves, bottoms green ground parsley flakes, floral accents from each frond tip, lavender vanda blooms, palm tree elements, lavender cattleyas orchids, hot pink roses, lavender dendrobs, coconuts are covered in bronze fine cut strawflower, trunk features reddish brown palm bark with accents of yellow cymbidiums. deck is covered with creme sesame seed and dark creme tomatoe seed, accents of green emu grass, red roses, dark lavender roses, pink roses raised water white fine cut everlasting and fine ground rice, coral accents are of mitsumati sticks, yellow, orange, red fine cut strawflower, floral arrangements are of dracena massangeana green with yellow and grey spanish moss, maches in front of treasure chest are of pink ginger, green ginger leaves and grey spanish moss, maches next to palm tree features amaryllis ambiance, white with pink accents, green strelitzia leaves and grey spanish moss. Kiwanians are volunteers changing the world through service. Kiwanis members help shelter the homeless, feed the hungry, mentor the disadvantaged, care for the sick, build playgrounds, and much more. No problem is too big or too small. Why? Because by working together, many can achieve what one person cannot accomplish alone. 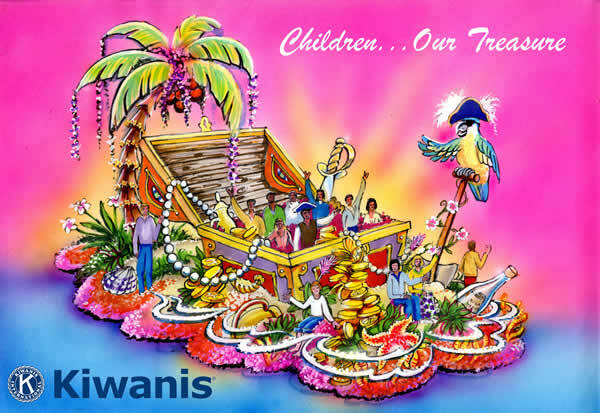 Since Kiwanis first came to the West Coast in 1917, Kiwanis members of California, Nevada, and Hawaii have been making a positive impact on the communities and people around them. From disaster relief efforts to youth scholarship programs, being in Kiwanis is all about “giving back.” With more than 15,000 Kiwanis members (and more than 48,000 members in our Service Leadership Programs), the Cal-Nev-Ha District is the biggest in Kiwanis International. Our clubs and members contribute in excess of $5,300,000 and 850,000 volunteer service hours to their communities each year! Together, we ARE changing the world, one child and one community at a time. Kiwanis members are guided by the six permanent Objects of Kiwanis International. These key principles were approved by Kiwanis club delegates at the 1924 Convention in Denver, Colorado. Although many years and countless leaders have come and gone since then, these Objects have always remained unchanged: · To give importance to the human and spiritual rather than the material values of life. · To encourage living by the Golden Rule. · To promote higher social, business, and professional standards. · To encourage and be servant leaders. · To build Kiwanis clubs that build lasting friendships and serve and strengthen local communities. · To promote justice, patriotism, and goodwill. 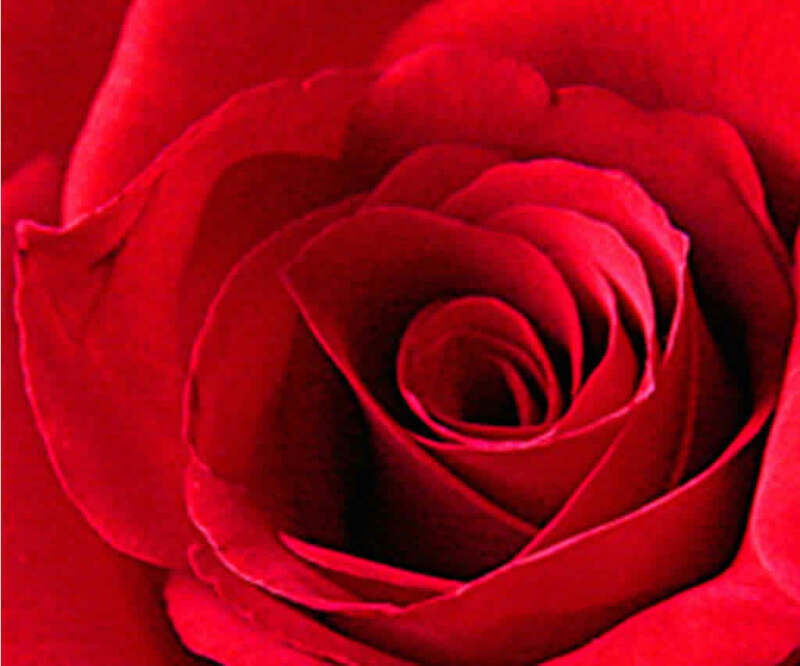 All text and information courtesy Pasadena Tournament of Roses.